I've posted before about my chicken run row covers, my modular sized beds (10ft by 30") mean that I can make something for one bed and it will fit all of them. The chickens have left the veg garden for the next few seasons and the chicken run turns into a row cover. I ordered some proper cloche cover off the internet and although it wasn't as cheap as builders plastic it should last a few years. Cutting it up to fit the cloches wasn't easy as it was pretty windy when I chose to do it. My three year old held the tape measure for me and we managed to cut them to size, it was amazing really, as without her help I wouldn't have been able to do it! 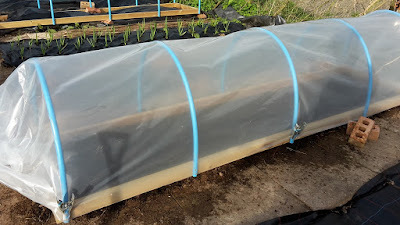 Currently all the covers are held on with spring clamps (like the type that market stall owners use), this means if I want to ventilate then I can lift the plastic up and hold it in place with a clamp. 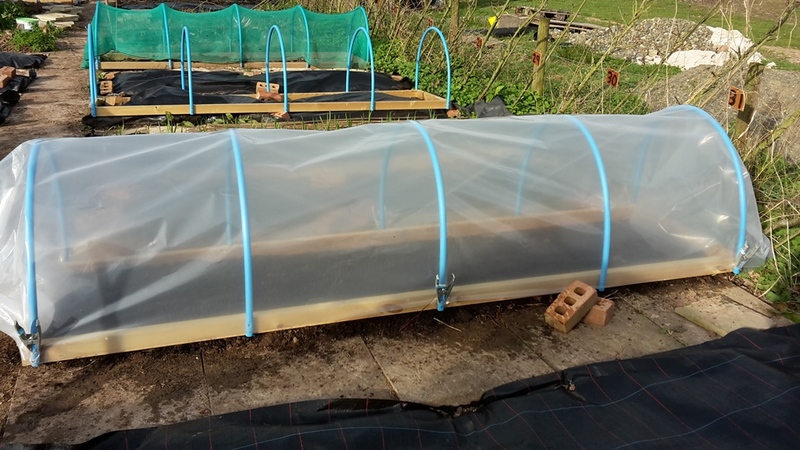 I've got four cloches like this made up so I'm hoping it will extend my growing season for earlier and later crops as well as helping some that enjoy a little extra heat in the summer (tomatoes and peppers). The one above has my early carrots (Paris Market) under it and I'll put one over my early potatoes, one over my beets and one over some salad. I'm really looking forward to using these this year and seeing how they work out. 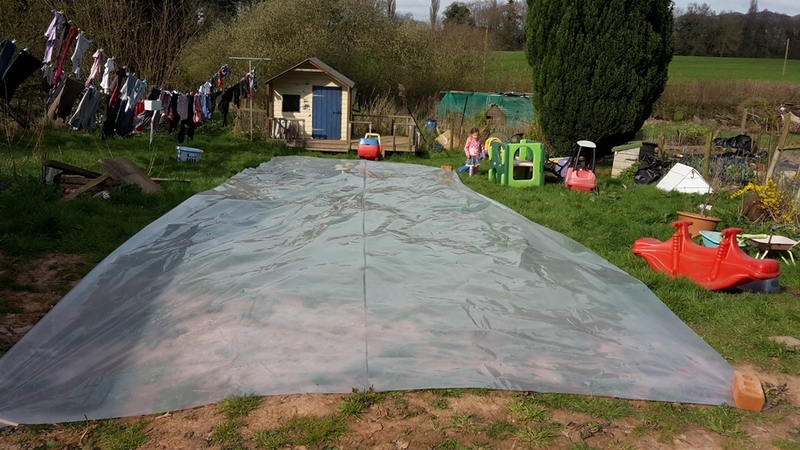 Anyone else make their own crop protection to extend the season? 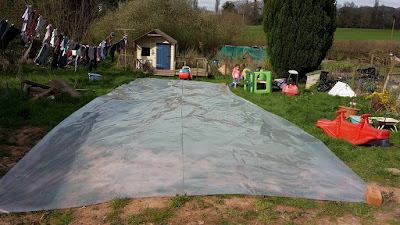 Every year hubby promises he will make me at least ONE cover with plastic. Still hasn't happened. But--I am having very good luck with my Agribon fabric coverings. Yours looks very tidy and nice. Talk to my husband!! Can you not get some of the flexible plastic piping and cut them down, slitting them so they clip over the blue pipes. 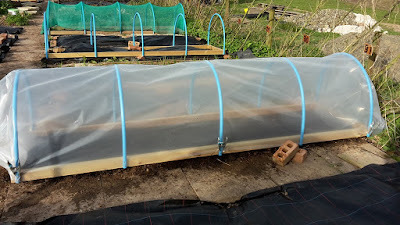 I use them for holding my netting cover on my raised garden, if the sizes are right it will make opening them easier. If you set something like that up here in my meadow, the pot chopper would be overhead and forest service would be flooding the place. They would think you were raising pot. The pot chopper comes and hovers over my meadow every few months, because it's the only clear space in a vast area of forest. They figure I just HAVE to be raising pot. Yes, but since I plant all my early crops in my raised beds, I have a cold frame that sits right on the bed framing and is fastened to the frame. The covers are hinged on the back and can be opened for ventilation or rain. Up here in the northern part of Minnesota I really need them not only for early crops but for tender plants like peppers or cucumbers that need the heat we don't always get during the day even in the middle of summer.